Back then, she didn’t know what stars were. She was just a little girl. Stars seemed like something far away, something literally out of this world. They were something different, something that you could look at and just wonder. Mysterious, and yet so simple, everyone knew of them. But no one knew what they were. Now the girl is standing alone before the world. Bright and clear, the sky does nothing to hide itself. Like an open chest of jewels poured out into the clear waters of the ocean, the treasures of the universe glow before her. Some of the gems are big, some are small. But they all make up a greater whole. They all have a place in the boundlessness, the seemingly unending deepness of the night sky. And before the stars, the girl doesn’t feel so alone. She doesn’t know what stars really are. But in that moment, she knows who she is. Stars are beautiful. Stars are bright. Stars can be seen by all. And, even though she’s still just a little girl in comparison to these jewels, she already knows that she is a star too. And if she’s a star, she’s the greatest one; she’s the brightest one. Because she’s more beautiful than the stars. She shines brighter than the stars. She is worth more than all the stars. How does she know that she’s a star? How does she know that she’s worth more than all the eternal, beaming crystals of the night sky? How can she, a little girl, be seen by all, just like the stars? She doesn’t know what stars are. And she knows that she can’t actually be seen by all. But she knows that she is seen by Someone. That Someone can always see her. And that Someone can’t stop looking at her. Because that Someone knows she’s more beautiful than the stars. She’s brighter than all the stars. She doesn’t need to be seen by all, because she’s seen by that Someone. And she’s worth more than all the stars. She is worth more than all the stars. She is worth more than all the treasures of the universe. She is worth all of that Someone’s blood. Because the girl knows this, she doesn’t need to know what stars are. She knows who she is. She knows that she is loved by that Someone. She knows what she’s worth. She knows that she’s that Someone’s star. And that makes her the brightest. Saw that picture on http://fujinsei.com/ and I knew that I had to write something about it. It’s crazy how something beautiful, but so simple (like a picture), can move us and inspire us to express deep feelings. That’s what this picture inspired me to think about. Showing you how awesome anime is…with explosively powerful pictures! Do NOT get in his way! Hey everyone! So lately, I’ve been posting a “Why We Love Anime” almost daily. What’s a “Why We Love Anime”? In case you couldn’t tell from the title, basically all that I do is post a picture that blatantly depicts how awesome anime is, and thus why we love it. Today, I’m going to show you the pictures you guys Liked the most, in order from least to greatest. So let’s reflect on how awesome the art of anime is! Coming in at 10th place we have Why We Love Anime #18. I love the emotion in this picture; it’s so characteristic of anime! Coming in 9th place we have Why We Love Anime #10. Once again, the emotion and the sense of friendship that emanates from this image is so profound. This is personally one of my favorites because it’s from Fullmetal Alchemist: Brotherhood, my favorite anime. Coming in 8th place we have Why We Love Anime #20. This is one of those cute, familial pictures that add a sense of child-likeness to anime. Child-likeness, not childishness. Coming in 7th place we have Why We Love Anime #21. This picture vividly depicts something we OBVIOUSLY love about anime: it’s epicness! And “epicness” isn’t even a word! Coming in 6th place we have Why We Love Anime #22. The fantasy feel and sense of sheer, determined power makes this picture an apt depiction of the thrillingness of anime. “Thrillingness”…yet another word that doesn’t exist! Coming in 5th place we have Why We Love Anime #24. For obvious reasons, this is one of the most Liked images. It’s beautiful, simply put. Everything is in it’s proper place. Coming in 4th place we have Why We Love Anime #2. Okay, undeniably this is one of the coolest pictures ever! The sense of motion, of intensity and magnificence are so evident that it’s no wonder this image was one of your favorites! Coming in 3rd place we have Why We Love Anime #23. Although it’s a simple image…it’s also not. The lucidity, the sense of wonder and amazement at the beauty of the universe…it’s a humbling, God-praising picture. Coming in 2nd place we have Why We Love Anime #8. I think I know why this picture came in second place…it’s just got so much swag! Everyone loves a douse of boss-sauce! Coming in 1st place we have Why We Love Anime #1. How fitting it is that #1 is #1! This picture got the most Likes out of any. To explain why, I’m going to quote what I said when I originally posted this picture. First of all, I love this image. It beautifully depicts what love looks like. You can see how both Emiya (the boy) and Saber (the girl) are giving of themselves to each other. Emiya is obviously giving himself entirely to Saber; he doesn’t even have the strength to stand. His lifeless body is falling into her. And she’s receiving him. Both of them are covered in Emiya’s blood, embracing each other through the blood. Love exists even through the pain. That’s exactly how love between a man and a woman should like. And look at the scenery around them. What’s flying around in the sky? Crows. Maybe vultures. Either way, both of those birds are symbols for evil and death. But look at Saber’s face. Even though they are seemingly surrounded by evil, the sky dark and the world decaying around them, they are both at peace. Because they’re holding each other, and real love exists between them. I don’t know who drew this, but I tip my hat to you! This is just another reason as to Why We Love Anime! My dear followers, enjoy these pictures! All art has the capacity to praise God. And I believe anime can do that too. That’s what I’m attempting to do with my book series. I hope you can agree! If you missed any episodes, go to my page Embark on the Journey: Volume 1 Episodes for a complete list of episodes. I open my eyes. The first thing I notice is that I am indoors, a white painted ceiling above my head. The next thing I notice is how comfortable I am. I’m lying in a bed with white sheets, and a pillow is under my head. For a few moments, I consider closing my eyes again, since the bed is so warm and soft, and I feel so exhausted. I feel like putting questions and curiosity aside. Few people almost die twice in only a couple of days. I don’t know why, but I honestly feel impressed with myself. My reasoning and mind dull from weariness, I plan on slipping back into my quiet, dreamless sleep. Then a thought strikes me; what if I am in a room in Tarsh’s house? What if I am some sort of captive of his? I grunt with determination, fully opening my eyes and rising from the bed. “Ah!” I say to myself as my back seems to light up like a torch. The room is simple. There is a dresser in one corner to my right, and a lamp sits on top of it. In the opposite corner of the room there is a strung bow and a full quiver of arrows. Directly in front of me is a table with a loaf of bread and some fruit sitting on it. In front of the table is a doorway, closed with heavy curtains, and on the either side of the doorway is a window from which light flows through. I get off the bed and stand. As the sheets of the bed leave me, I look down and see that my torso is bare, as are my feet, but I still have my breeches. I note with gratitude that someone has bandaged my back, having wrapped a tight cloth around my torso and tying it at my left hip. I frown and grunt, pain racking my body. “Where’s my sword?” I suddenly think. I look about the room, not seeing it anywhere. Then I turn around to search on the opposite side of the bed. I flinch in surprise. There is a girl sitting in a chair on the opposite side of the bed. She is sitting erect, resting her head against the wall, and when our eyes meet she smiles. “How long have you been watching me?” I ask, still surprised. “Why?” I ask suspiciously. Could she be a friend of Tarsh’s? “To help you if you needed anything,” she says simply. I swallow, and I don’t know what to say. I know I should be outrageously thankful to her; she saved my life. But I’m not sure I’ll be able to repay her for all that she’s done. “Well…thank you,” I say. She nods her head once in acknowledgement. I snort at her mildness. I draw the table over to the bed so that I can sit on the bed while eating at the table and Faith draws her chair over from the opposite side of the bed. We sit across from each other, and as she distributes food to me and herself, I study her. She has longish, dirty-blonde hair and round blue eyes that give her a friendly appearance. Her build denotes that she is frequently physically active. Her skin is slightly darker than mine, but my skin is very fair. She’s a pretty girl. “Do you hunt?” I ask, eyeing the bow in the corner of the room to my left. “Do you live alone?” I am curious to know what a girl my age is doing out in the world seemingly by herself. I silently wonder if she has had the same trouble with parents as I have had. She pauses and averts her gaze. I look away, and my cheeks sting; I didn’t mean to pry. It seemed like a fair question to ask. “To make a difference,” I hear her say. I nod and say thoughtfully, “Well, I can’t argue with that.” I think for a moment while we are quiet, when suddenly I realize something: Faith is a huntress. Maybe she has seen the Evil that took my siblings. And if not, maybe she would be willing to help me track them too. I have to ask. “Faith,” I say, “you haven’t by any chance seen a group of Evil in these parts, carrying with them two children?” My heart jumps when I realize that the Evil may have already eaten or killed my siblings, but I hold my tongue. “Yeah, me too,” I say grimly. My face has grown tight and I stare downwards angrily. I hear Faith breathe, and I can tell she’s watching me. “What do you know of this band of Evil?” she asks in a cautious, quiet voice. I grunt. It’s not as if Soror and Frater deserve to be saved. I’m just doing it to get back at the Evil for stabbing me and because I know I ought to rescue my siblings. “Let me help you,” Faith suddenly says. “Why?” I question. Not every person, let alone a Beloved, would want to hunt a group of savage beasts. “I thought you came here to look for something fulfilling, and to make a difference.” Almost immediately as the words leave my mouth, I wish I wouldn’t have asked such an honest question. If she’s offering to help me, why would I say anything that would discourage her? I want her help, after all. I admire how caring she is, but I have to ask, “Are you sure? You just met me.” It’s only right that I question her integrity, and I don’t want to seem too desperate. “Of course,” she says, rising from her chair. She begins packing food while I retrieve my sword from where she placed it on the bed. I behold the blade with an air of dissatisfaction; my sword is a mere double-edged piece of metal with a brown oaken handle. It has no cross-guard, no name, and it’s probably not as sharp as it should be. While I am staring at the blade, I think, “I could’ve sworn that sometime ago, this sword had a cross-guard, and even decorations.” This sword was my father’s before me, and he must have forgotten it when he left, or whatever happened to him. All grown Knights are supposed to have a sword, whether it’s handed down to them or they find a way to have one made for themselves. Why every man needs a sword, I don’t know, but I guess that, in my case, I should be thankful to have one at all. Next, I properly dress myself, garbing myself in my shirt and cloak, wincing as I irritate my wounds. Traveling, I realize, is going to be much harder now, let alone fighting. Once I’m done dressing, I leave the house through the curtain door so Faith can change into more athletic attire. I wait in the bright sunlight outside, enjoying its heat, all the while looking into the deep, dark blue sky. We leave her small dwelling and visit two houses, where Faith says “goodbye” to two of her friends, each one residing at a different home. Both her friends are girls, and they seem to be unaware that Faith is about to do something dangerous. They don’t ask her where she is going; they just hug and say goodbye. Then we stop at a third house. Faith knocks on the door from where she is standing on an elevated wooden porch, and above her is a wooden roof. I stand off the porch and to the side. “Hey,” Faith says in response. “What’s up?” asks the guy. “I see,” he nods. Watching him closely, I see him frown, and his eyes assume a suspicious glare. “Who’s this?” he asks Faith, gesturing with his chin at me. “Oh,” says Faith, “this is John Hedekira, the person I’m helping.” I nod at her friend as she introduces me. “Not at all,” I add. I can tell that Bernard would be very helpful in fighting the Evil we are tracking, based upon his size. “I won’t,” I say firmly. Bernard nods, seeming satisfied, and then he says, “Good luck.” And turning away, he walks back into his home and shuts the door. As you know, I always place the cover of the next book in the back of the immediate book. So, since I’m about to publish Volume 5, my sister and I have been working on the cover of Volume 6. We’re close to being done…just not quite yet! 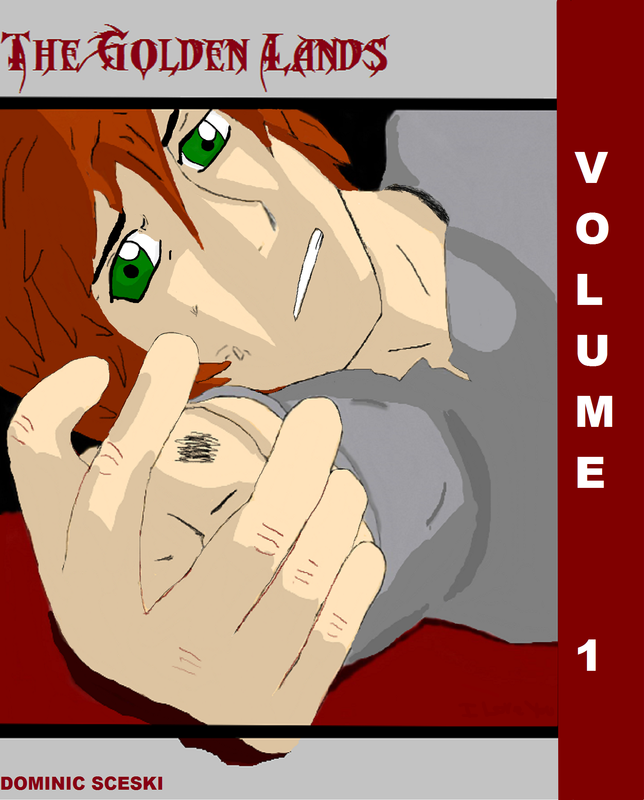 However, benevolent blogger that I am, I decided to give you a sneak peek of Volume 6’s cover to get you pumped up!!! A masterpiece in the making! Can any of you guess which character this is??? Volume 5 is almost here! Stay tuned! Showing you how awesome anime is…with gorgeous pictures! As always, I find it exceedingly fitting when a girl is depicted among the beauty of creation, but with her as the focal point. It is simply yet another indication of how God created women to be the “crown of creation”. It gives women the honor due to them. Check out Christy Nicholas’s upcoming book! Legacy of Truth is set in Ireland around 1800. It’s a prequel to Legacy of Hunger, and the second book in The Druid’s Brooch Series, but it serves as a stand-alone novel as well. It should be on pre-order in May, and published in June 2016. The following is an excerpt from the novel. The main character, Esme Doherty, is a young woman growing up on her parents’ farm in Ardara, County Donegal, Ireland. As she approached the tumbled ring stones, covered in reeds and grasses on the modest hill, she saw Alan, waiting for her. She smiled to see her friend. She treasured her time with Alan even more than her solitude.